CHICAGO (WLS) -- Police are warning residents of Chicago's Albany Park neighborhood of a man who grabbed a 13-year-old girl's backside while she was walking home. 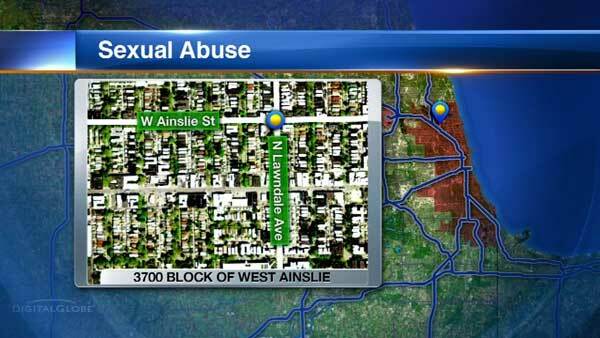 Authorities said a man walked up to the girl from behind in the 3700-block of West Ainslie Street around 8:45 p.m. Monday. She told police he said some words in Spanish that she couldn't understand and groped her. When the victim screamed, he took off through a nearby gangway. The suspect is described as a Hispanic man that is about 5 ft. 5 in. tall and weighs around 150 lbs. He has black hair and a medium complexion. He was wearing a black and red knit cap, black waist-length canvas work jacket and shiny, dark-colored athletic pants with three white vertical stripes. Anyone with information regarding this incident should contact Area North detectives at (312) 744-8200.